Diane Hoeptner: Before you sell it on Ebay, PAINT IT! Before you sell it on Ebay, PAINT IT! I bought two old wood dolls --to sell on Ebay. And instead of selling them, I started painting them. Here's the Pinocchio doll sitting on a Sponge Bob beach chair. Sponge Bob looks like a monster in the background! 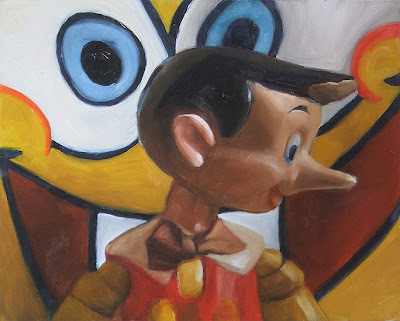 Watch out, Pinnochio!! This is surreal ... and fun. Interesting piece.